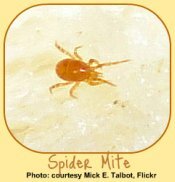 Spider mites are among the most common garden pests to plague the Indoor Gardener. Here's how to find them and stop them in their tracks. parts of mouth that pierce the houseplant called "chelicerae"